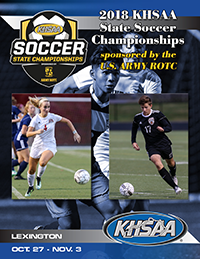 Registration is now open for the 2016 KHSAA Soccer Officials Advanced Camp. This year’s camp will be held July 22-23 in Lexington. Licensed officials are required to attend this camp once every four years to be eligible to work Region/State postseason contests. Please note you must also register to officiate games for the Bluegrass State Games. For directions on how to register for the Bluegrass State Games, click here. For questions about the camp, please contact Chad Collins or Assistant Commissioner Michael Barren at the KHSAA.